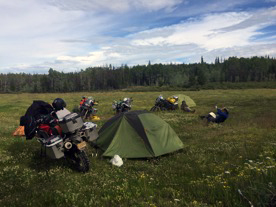 Strangely enough the Chilcotin Adventure ride started at the 2015 Steens Campout. BMWRO members Don Chase, Milton “Butch” Farrand and Bob Whitlock started discussing adventure rides that involved a ferry trip. And not just a quick ferry trip across a river but a big ferry trip of at least a couple of hours. Don started laying out the groundwork for such a trip through the fall and winter months. The trip had to have the following adventure items - a long(over 2 hour ferry trip), plenty of dirt/gravel roads and wilderness. Having done many years of boating up the British Columbia coast Don knew an epic ferry/wilderness adventure was possible. 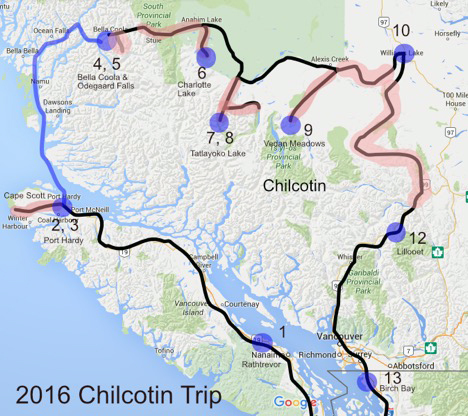 The plan was to ride up Vancouver Island to Port Hardy then take a ferry to Bella Coola and ride east exploring the remote Chilcotin plateau. Extensive Internet research revealed a trove of wilderness locations and adventure riding. Also revealed was that reservations for ferries and motels were needed in February. So Don, Don’s wife Kim as well as Butch and Bob signed up for the trip by making ferry reservations. The trip started two days early with Butch and Bob traveling up wet coast on Highway 101 to the first ferry in Port Angeles. Don and Kim would meet them there. Realistically the trip started on July 10th with a ferry trip from Port Angeles to Victoria and a ride to Rathtrevor Provincial Park where we camped for the night. The next day the weather was cloudy but cool but that would change as we rode up Vancouver Island towards Port Hardy. Right after Campbell River the rain started along with an unexpected RCMP road block. The RCMP was checking all motorcyclists for proper licensing endorsements. This was unusual but no problem for us but not for two other riders. As we rode towards Port Hardy we got our first taste of wilderness - the road was lonely, had beautiful mountain views,and hours of driving through deep forests. We got into Port Hardy full of excitement. The next day we rode out to Cape Scott Provincial Park at the far northern end of Vancouver Island. It’s about 25 miles one way of gravel roads from Port Hardy which turn progressively worse with pot holes and mud until you are at the end of the road and at the end of the world - so it seemed. We hiked the 3 mile round trip out to San Josef Bay to see the wild Pacific Wes Coast. The Provincial Park warned of wolves in the area. How many times have you had to heed that warning?The weather cooperated and we had a great but short time on the beautiful beach. We succeeded in getting our first gravel/dirt/mud in and were ready for more. 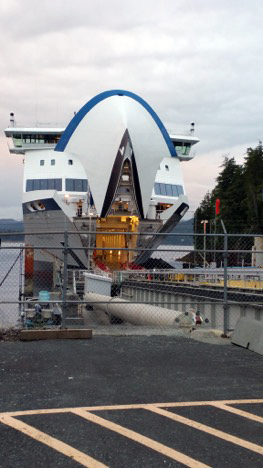 BC Ferries wants folks to be ready to board the ferry at 5:45 AM. That meant we had to be packed and leave the motel by 5:20 AM. We rose early and drove the short 5 miles to the ferry terminal only to be greeted by many other vehicles and travelers. The bow of the MV Northern Explorer was open and it looked like a giant mouth open and ready to swallow us and a lot more.We were given priority boarding and got settled on the ferry. That meant using giant tie-down straps to hold our bikes in place. The ferry had 7 decks and to climb up from the vehicle deck was quite a feat in itself. We found good viewing spots and proceeded to enjoy the scenic cruise up the Inside Passage to Bella Bella about 5 hours away. The cruise, er… ferry trip was beautiful but seeing the rich marine wildlife was even more exciting - we saw white sided dolphins, killer whales and humpback whales on our journey. The 5 hour journey passed quickly and we disembarked the ferry and rode into the tiny native coastal community of Bella Bella. The Bella Bella ferry terminal is quite small and doesn't’t offer a lot of amenities. We sat and waited along with other travelers mostly from Europe in cars and motorhomes. We were the only motorcyclists. The MV Nimpkish is a small 16 car ferry with two small cabin areas -one on the port side and one on the starboard side that will comfortably seat about 30-35 people. There’s no galley just a small help yourself snack bar filled with vegetables,cookies, tuna fish and crackers,instant soups, soda pop and water.The ferry trip from Bella Bella to Bella Coola takes over 11 hours and goes through some incredible mountainous coastal fjords. The mountains rise 6,000-10,000 feet above the emerald green waters.Again we saw whales along this long trip. The ferry stops at the fishing resort community of Shearwater, an old mill community(that’s nearly dead) called Ocean Falls and our destination Bella Coola. The day turned into night as ferry continued on to Bella Coola.We arrived just after 12:30 AM and got into our motel for the night. It was a long day. The next day Don and Kim ventured farther up the Bella Coola valley to a campsite while Butch and Bob remained in town. 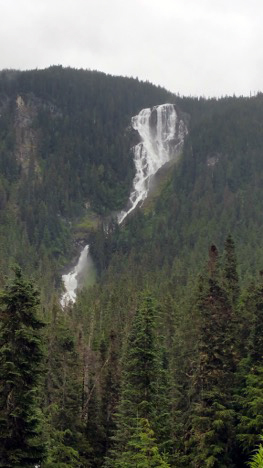 Internet research said a day trip to Odegaard Falls is a must when visiting the area.Butch, Don and Kim rode the narrow, rocky and bumpy gravel/rock/dirt road 15 miles to see the falls which were quite incredible.The falls tumble well over 2,000’down a sheer rock wall. Glimpses of tall snow covered peaks were around almost every corner when the tall trees provided a view. The scenery and ride was very awe inspiring. At Don and Kim’s campground tall rocky mountains with long slender waterfalls surrounded them. It was magical. By now we were 5 days into the trip and a big test and feat had yet to be accomplished.To go inland, away from Bella Coola we had to tackle “the Hill.” “The Hill” is a 20% grade incline dirt/gravel road that climbs out of the Bella Coola valley and deep into Tweedsmuir Provincial Park.The road switch backs right up a mountain side with a 1000’or more drop on one side. To make matters worse a road grader was grading the road leaving it with soft dirt and an 18” berm to deal with.However we made it fine to the top of Heckman pass at over 5,000’. We stopped to celebrate at a local cafe in the small native town of Anahim Lake. It was there we learned of an“aggressive bear warning” at our first campsite in the Chilcotin - Charlotte Lake. We traveled down the 15+ miles of gravel road to a gorgeous lake side campsite with an incredible view. We were the only people there. We made a roaring fire and took all necessary precautions to keep a clean camp and avoid any bears. As we left Charlotte Lake the next day Don and Kim saw the sow grizzly and two cubs running off the road about 2 miles from our former camp. We traveled to the small community of Tatla Lake where we got gas and learned more about the roads we were about to ride. Unfortunately we learned that this summer was the wettest on record. Some of our route had to be changed because of muddy roads. Our next camp was the incredibly gorgeous campsite at Tatlayoko Lake about 23 gravel/dirt miles away. Snow capped mountains rise right off of the deep fjord like lake.it was so beautiful we decided to stay two nights here (days 7 & 8). 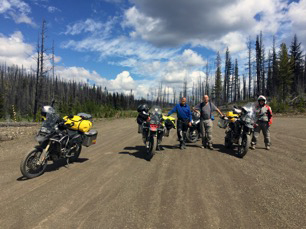 To further explore the area we did a 55 mile gravel/dirt ride-day trip to the Chilko River at the north end of Chilko Lake. Here we met a Xeni Gwetin Land Ranger who welcomed us to their tribal lands and was a wealth of welcoming information. Each afternoon in the Chilcotin we had to deal with strong thunder storms and wet weather, day 9 was no different. As we traveled down the Tsaeko Lake Road to get to the Nu Chugh Beniz campground at Chilko Lake we had to turn around because of thick and slippery mud on the road. The mud was between 4-6” thick and gave each of us a scare. Add to that a dark, black thunderstorm was ahead making us think conditions could only get worse. As a result we decided to turnaround instead of going further and camp at a nearby beautiful meadow.Unfortunately this meadow was infested with hordes of hungry mosquitoes which tested our patience and sanity. Day 10 started with surprising news. One of our team members - Bob Whitlock - was not feeling well and had decided to go home rather than continue. So now our group was Don, Kim and Butch. We rode out the 30 miles of dirt/gravel and mud to have breakfast and get gas at historic Lee’s Corner and decide what to do next. A road maintenance worker strongly suggested we visit Farwell Canyon. This was an excellent suggestion. The Chilcotin River tears its way through the earth and forms a deep and stunning canyon. The gravel/dirt road was steep and had numerous steep switchbacks dropping down into and out of the dramatic canyon. After visiting the canyon we finally got back onto pavement just a few miles out of the town of Williams Lake. Another afternoon thunderstorm helped us decide where to stay - in a motel versus camping. This was a welcome decision as it rained almost all night and it was good to relax in a real bed and take a shower after several days of camping. The next morning’s weather was no better but we decided to go ahead with our ambitious plan of 120 miles of gravel/dirt and mud. We traveled through some incredibly remote wild and remote country that was dotted with a few native communities. 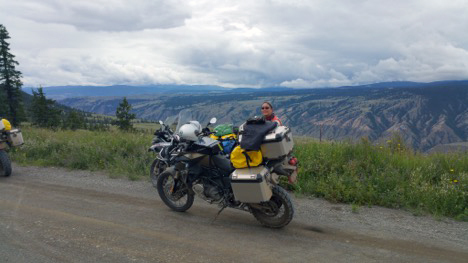 The roads wound through forests and canyons along the upper reaches of the Fraser River. We rode for hours and hours seeing no one. Several times we saw herds of wild horses but no people. In 120 miles of gravel/dirt and mud we came across only 2 vehicles. The 120 miles of roads were very remote, steep in places (14-16% grade or more), narrow, muddy, slippery and filled with gravel and rocks. We finally came out at the tiny native community of Pavilion on Highway 97 with a great sense of accomplishment. From there we rode the highway to our campground at Lilooet. We celebrated our 500 miles of gravel/dirt adventure riding that night at a Greek Restaurant. From Lilooet we rode the beautiful Duffy Lake Road with it’s twists and turns and sweeping views of glaciers and snow capped peaks. The Duffy Lake Road is a bucket list ride in itself.Then on to the Sea To Sky Highway through Whistler and Squamish and into the city of Vancouver. Unfortunately we were in Vancouver near rush hour and after days of wilderness riding we were in culture shock trying to navigate the stifling city and commuter traffic. We finally made it to the US-Canada border, out of the traffic and to our final trip campsite at Birch Bay State Park. Our gravel and dirt road riding days were over but we still had one more ferry ride. The morning was beautiful and we stopped at a wonderful “farm-to-table” bakery/cafe for a delicious breakfast and then onto the Washington State Ferry at Coupeville going to Port Townsend. This short ferry ride helped us avoid the Seattle traffic by staying on the west side of Puget Sound. We traveled down through Bremerton and Belfair on our way home. Again the traffic was shocking after days of remote riding. Butch turned off just south of Shelton to continue his ride home towards Florence, Oregon. In summary the ride was over 1,600 miles with about 500 miles of the trip gravel/dirt/mud. The off road portion was definitely challenging and rewarding. What struck me most was the realization of riding through some incredibly remote country and wilderness. It’s hard to believe but yet still refreshing that this kind of wilderness still exists. This was a bucket list adventure ride.